With balmy summer nights a seemingly distant memory, autumn has arrived with its fickle and at times unpredictable weather. It is now time to pull out your winter woollies and get ready to snuggle up on these lovely cooler evenings. For centuries, people have been keeping themselves and their families warm and safe at night by sleeping under wool, and there is now scientific evidence that sleeping on and/or under Merino wool improves sleep, rather than on or under modern synthetic fibres. 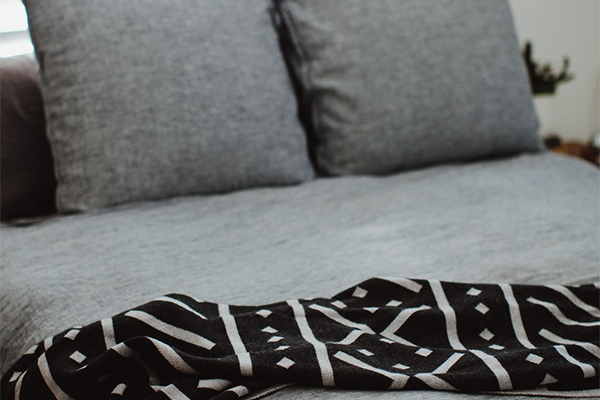 Here are some great reasons why using a blanket made from merino wool, rather than a synthetic blanket or doona can help you and your loved ones sleep more soundly, sleep for longer, and wake up less. Forget the outdated concept of itchy wool blankets. When you buy beautiful quality Merino wool, especially products that carry the Woolmark approval (like what you get here at Jude), you are guaranteed quality and softness due to the innate fineness of the fibres of Merino wool. These fine fibres, paired with a naturally higher lanolin content, makes for a knit that is soft, silky and supple to the touch. The kind of soft that you’d be happy to have cuddled up against your neck on those chilly nights. The ability to absorb moisture is an important function and attribute of the Merino fibre. Equally important is its ability to release this moisture. In contrast to most synthetic fibres, Merino has the capacity to remove large amounts (up to 35% of its own weight) of moisture from the skin surface before the fibre even begins to feel wet. Merino can prevent the ‘clamminess’ that can occur in environments of high humidity, therefore as temperature increases and decreases throughout the night, you will stay warm when its colder, and stay cool when its warmer. Amazing, huh?! Wool is naturally odour and dirt resistant and requires a lot less washing. Bacteria and other micro-organisms can build up on the skin, and therefore in clothing and bedding. Using merino against the skin helps greatly reduce build-up of bacteria and controls odour by actively moving sweat and other moisture away from the skin. For this reason, merino out performs other fibres in terms of its resistance to the build-up of bacteria and odour. Merino wool can be washed in the washing machine (always check the care label first) and dries very quickly. So, wear and air your merino, this means you’ll wash it less, saving time and precious water! Wool is naturally fire resistant and will not burn. Merino fibre has natural flame retardant properties exceeding those of all other commonly used textile fibres and affords excellent protection to wearers in terms of preventing ignition, but also in terms of the nature in which it burns – it is self extinguishing and non-melting. Merino wool is a natural product which provides a natural and safe sleeping environment – it is a great fibre for children and babies. ITS HEALTHY FOR YOUR BABY. If night time temperature is less than 24 degrees, then your newborn baby will either need several layers of clothing and bedding or natural body temperature regulating fabrics like 100% pure merino. Using Merino against the skin will ensure that when your baby needs the warmth (because they can’t regulate it themselves) then the properties of merino will retain and circulate the body heat. Likewise, when you put your baby to bed during the day or early at night when the heat is still in the sun, the natural merino properties will draw and release moisture away from the baby. On top of all of these remarkable, innate features of the beautiful, natural fibre that is Merino wool, it is also naturally renewable and biodegradable. Not only it kind to you and your most precious loved ones, it is also kind to our environment. Doesn’t that make you sleep more soundly too?! HERE ARE SOME PRODUCTS FROM JUDE THAT WILL HELP YOU SLEEP SOUND. 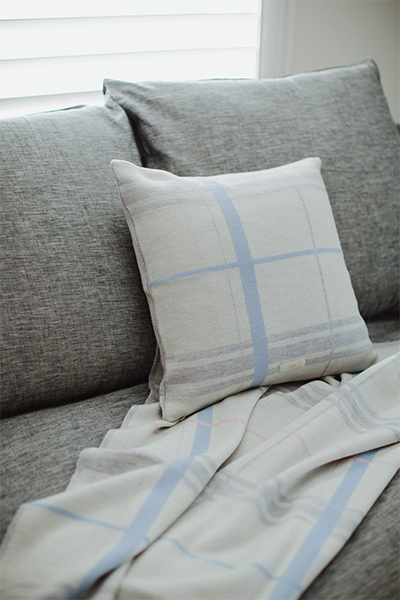 Mackensie Cushion $149, and Blanket, available in various sizes starting from $349. 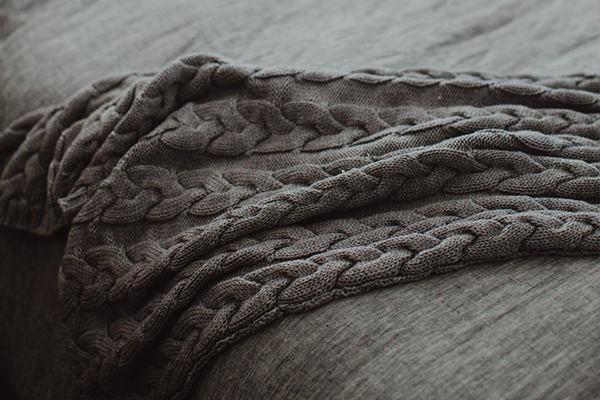 Jude’s Cable Blanket in grey, available in various sizes, including an extra large bed cover, $699. Shop it now. 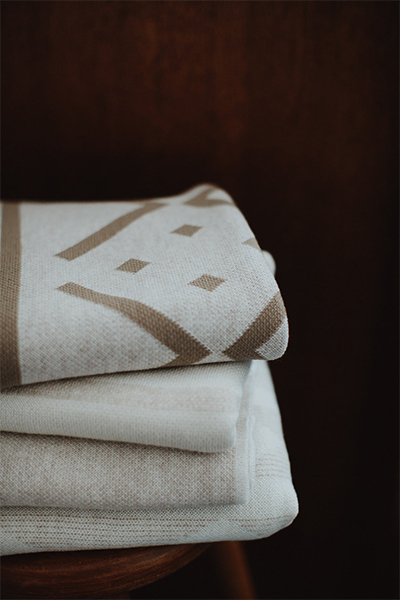 A selection of beautiful Woolmark approved Merino wool blankets are available to purchase at the Jude Online Store. 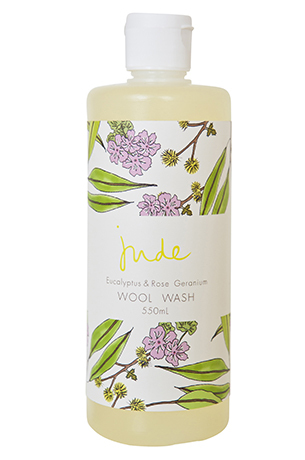 Eucalyptus and Rose Geranium Wool Wash, $18. All natural, eco-friendly and Australian Made. Shop it now.